Saint Agatha is recognized by the church as a Virgin and a Martyr. We are certain of her martyrdom, but there are many stories told about her life. She probably died in 251 during the Christian persecutions under Decius which lasted from 240 to 251. Reportedly, she was lovely and of noble birth, and caught the attention of Quintian, the Governor of Sicily. However, Agatha refused Quintian, having taken a Christian vow of purity and devotion to Christ. In retaliation, Quintian reportedly sent Agatha to a house of prostitution. Despite an extended period of time there, Agatha remained firm in her vow. Quintian then reportedly had Agatha imprisoned and brutally tortured. She is supposed to have been healed of her wounds when St. Peter appeared to her in prison, however Quintian's tortures continued and she finally died unshaken in her devotion to Christ. A year after her death, a city survived the volcanic eruption of Mt. Etna. People became convinced the city had been spared because of St. Agatha's prayers. Devotion to her spread beyond Sicily and was so fervent in the early Church that St. Agatha's name came to be included in the first Eucharistic Prayer. She is honored for her courage in suffering and her devotion and commitment to Christ. St. Agatha is the patron saint of Sicily, nurses, bakers, miners, jewellers, Alpine guides, and those suffering from breast cancer. She is also the protector against earthquakes, volcanoes, fires and thunderstorms. 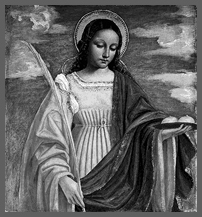 St. Agatha's Feast Day is February 5th. 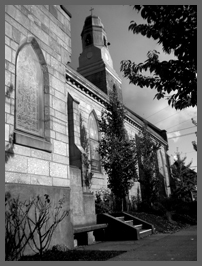 St. Agatha Catholic Church was founded in 1911 when Sellwood was a small village with unpaved streets. 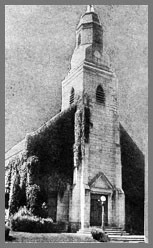 Prior to that the Catholic residents of Sellwood were served by the Benedictine fathers at Sacred Heart parish in the Brooklyn district. Many children walked three miles of board sidewalks and muddy streets to Sacred Heart School. A group of three women concerned about the distance and the road conditions, appealed to Archbishop Christie for permission to build a parish school in Sellwood. They received excellent neighborhood support for this venture as they went door to door. In April of 1911, St. Agatha was established canonically as St. Agatha Mission, and Mass was celebrated in the homes of a few of the Sellwood Catholic residents. The parishioners met with Father John Cummisky, OSB, the pastor, and it was decided that a two story brick building would be built to serve as a school and chapel. A bungalow residence was built for the pastor adjoining the parish. On Thanksgiving Day, just a few months later, Archbishop Chrisite assisted by Rt. Rev, Abbot Placidus, OSB, Very Rev. Prior Adelheim, OSB, Father Cummisky and other clergy, dedicated the new combined church and school building. The Benedictine Sisters from Sacred Heart Parish opened the school in February 1912 with 38 registered pupils. 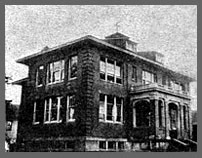 In 1915, The Sisters of St. Mary of Oregon agreed to direct and staff the school which they did for 58 years. Over time the enrollment climbed to 175 students as Portland grew. 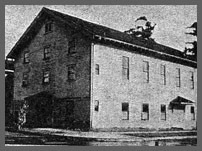 The Mill Lumber Company came to the area, bringing with it many Russian Catholic immigrants which further came to the area, bringing with it many Russian Catholic immigrants which further increased enrollment. Since Vatican II, the doors of the school have also been open to other students desiring a Christian education. Among some of the school's notable graduates is Dorothy Hester Stenzel, an acclaimed pilot in 1930, and a member of the Aviation Hall of Fame. 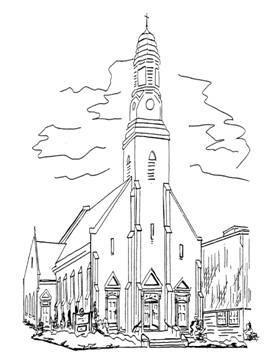 The cornerstone for the current church was laid on New Years Day, 1920, and the church was dedicated October 3, 1920 on Holy Rosary Sunday by Archbishop Christie. The church was designed in the Early Gothic Style, measuring 70 x 120 ft., built of hollow brick and native tufa stone quarried on land belonging to the Benedictine fathers at Mt. Angel. On December 21, 1924, the marble high altar was blessed, and the hand-carved crucifix, the work of Oregon artist Esther Hult, was unveiled. The first eighty years of St. Agatha under the leadership and direction of the Benedictine fathers were remarkable for their commitment to growth and construction in the parish. In 2000, the Benedictine fathers turned over their pastoral responsibilites to the Archdiocese. During the last five years of his twenty-one year tenure as pastor, Father Cosmas White, OSB supported the launch of the campaign "Our Children, Our Legacy." In the fall of 2001, construction began on-site for the new school building and gymnasium. The new facilities opened for students in January 2003.